Everything you need to know about Kara's Flowers is here. Music, lyrics, albums, etc. Whenever we find out new information, we try to update the page as soon as possible. Whether it's lyrics, random information about a song and maybe even guitar tabs in the future, we make sure you know what we know. If you need to know anything, I check my email everyday, so just "leave a message. I'll call you right back." Hi people, we finally masterized the 3 studio albums that Kara's Flowers recorded between 1994 and 1999. The songs are in mp3 format, the rest of the albums will be uploaded soon. Enjoy! Kara's Flowers - We Like Digging? Hi people, we finally got our social networks active! "They have lost many old fans and gained many new fans so I guess as far as they are concerned they have what they need... fans. As long as they don't lose all the fans they don't care, right?" we are talking 20 years at this point. we all grew up together in LA. 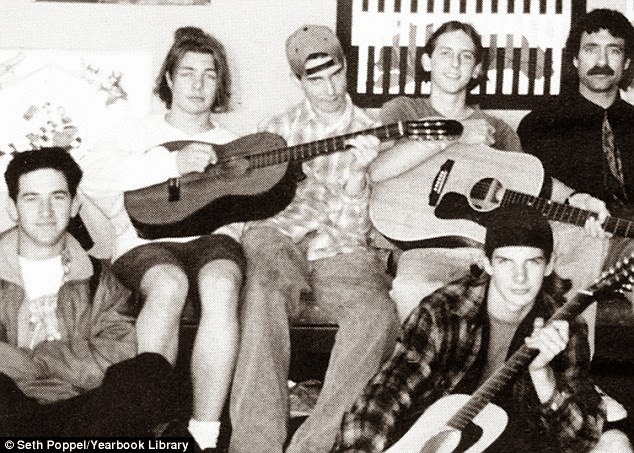 played shows as teenagers. toured together. we lived in the same households. i still have the Kara’s Flowers’ first demo on a goddam cassette. Okay, so he has the first Kara's Flowers demo. That's cool. What's your point? My point is... as far as I know... the only thing by KF released on cassette was the Soap Disco single (which I am a proud owner of). Even then, we're talking about the first demo and I'm pretty sure ...We Like Digging? was their first demo. Either that was released on cassette, they made a demo before that (which we'll probably NEVER hear) or it's a slow news day. Probably the latter. If it's the middle one, hopefully they release some songs on their unofficial Kara's Flowers 20th Anniversary Deluxe CD Package (which will probably never come either). So, thanks for reading for this long. To make it up, here's some picture I found from 1994. We Are Now On Soundcloud!!! You can now listen to Kara's Flowers music on Soundcloud here. We'll post their discography very soon, but to start it off, we've posted 'My Ocean Blue' live from the KCRW radio show they did and 'Heads of Them' from the Whisky's show they did in 1995. Some other live songs will follow after this post, so "check it out and see what it's all about!!!" Kara's Flowers was born. While Adam doesn't think much of Kara's Flowers, I'm sure everyone else does. From tracks like 'Leave A Message', 'Myself'' or 'Everyday Goodbyes', they won over the people of Southern California. Sure they had rough times like the tour with 'The Fourth World', but what about all those good times? Playing their first show at the Whisky's in 1995? Going to Five Towns college where Adam and Jesse found their true potential? Playing new songs during of 1999 such as 'However Whatever' or 'July'. They seem to be forgetting all those times they had. You can hear the emotion when they play songs like 'Everyday Goodbyes'. Yet, Adam still consists that Kara's Flowers wasn't anything special. People say that their lyrics were 'rudimentary'. So, the song 'Peeler' wasn't a statement by Adam that he was never going to 'peel' away from the crowd and sell out like other artists do or that 'Ray Pim' isn't a song about how Adam feels like he is killing time until he "makes it" and the themes such as loneliness, isolation and boredom are nonsense? The thing is, you have to understand what they mean in order to "get it". 'Loving The Small Time' is a song about finally having local success (Keep in mind this was late 1994, around the time they sold around 500 copies of '...We Like Digging?') "Myself" is about not letting drugs get the best of them and how they've seen "all those remedies" and although they have "choked" on all those remedies, they will maintain self control and "have their health". While some songs like 'Clomb' or 'Give Me Love' appear to make no sense, they where just doing what their favorite artists were doing. But anyways, Kara's Flowers truly is amaing. Sure, The Fourth World sold bad, but when you have zero to no promotion and your tours consist of ska fans (as opposed to power pop fans), you won't get good results. So.... sorry for the long post. I just love Kara's Flowers. I wish I could hear all their material (However Whatever, Give My Life, etc) and I'm sure we all do. The Fourth World was re-released on their 10th anniversary in 2004, so who knows what could happen... Hopefully, it's not re-released XD But yeah, happy 20th anniversary to Kara's Flowers. I'm always adding minor fixes to the blog, so if you think I never check this, I do. I always check my email, so if you ever need the live version of 'Everyday Goodbyes' or you happen to have a bootleg of a Kara's Flowers show, hit me up. As always, all things must pass. I wish I could surprise you guys with a live version of 'Not Falling Apart' or something like that, but I always like to share any songs as soon as I get it, so I can't really give you anything but this long paragraph. So, goodbye!!! !